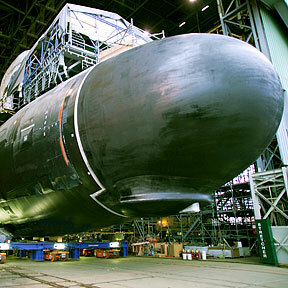 NOW, MORE NUKES: The Navy's newest nuclear powered submarine, the USS Hawaii, is shown here under construction in Groton, Conn.
Police arrest the driver after his bus breaks a fence and slams into a house in Kahaluu. The Navy's newest, $2.6 billion stealth Virginia-class nuclear submarine, the USS Hawaii, will be blessed Saturday at a Connecticut shipyard. A three-day conference on children's literature has sessions for anyone interested in the genre. The 13-year-old North Shore surfer earns $1,000 and is headed to France for an event. Fifield Cos. picked the Wave Waikiki site as one of the last available spots in the tourist mecca. Average gasoline prices in the past five weeks show Hawaii motorists paid 10 cents more than price caps would have allowed.